The elaborate image of a tirailleur of the 146th New York Infantry, also known as “Girard’s Tigers,” features a Zouave style uniform known as a Turco. The unidentified soldier wears a light blue uniform with yellow trim. The editor asks the readership to participate in the goal of preserving 9000 acres around the Custer Battlefield National Monument. Only 760 of the newly released federal land will be preserved unless it is purchased and then donated to the National Park Service. The editor also notes that the article “The Famous Petersburg Photo” (January-February 1984) should have included Harris Andrews as co-author with Brian Pohanka. The letters to the editor provide some further insight into the New Hampshire cap (which was featured in a past issue as well as the current issue of Military Images), the correct uniform of a Scot’s Guard officer, and a correction regarding the use of the word “Congressional” when referencing the Medal of Honor. There are four different publications reviewed for readers in this issue. First is The United States Cavalry: An Illustrated History by Gregory J.W. Urwin, a short history of the cavalry from the Revolutionary War to the single cavalry unit to see action in World War Two, including 32 color-plates and 100 black-and-white photographs. Next is The Civil War in Maryland by Daniel Carroll Toomey, who presents a detailed chronological accounting of over 280 different large and small conflicts between Federal and Confederate forces in this border state. A Battlefield Atlas of the Civil War by Craig L. Symonds, with cartography by William J. Clipson, provides readers with a way to view the flow of Civil War battles by using simple and uncluttered maps in an organized chronological format. Those who hope to use this book at a site may have trouble, as modern roads are not marked. Lastly, the recorded album Civil War Guitar: Campfire Memories by Kirk Browne is reviewed. Using an 1850 Martin guitar and with occasional accompaniment with fiddle, harmonica, and banjo, listeners get to hear a selection of songs popular with soldiers in the North and the South. Lyrics are included in liner notes, but no vocals are featured in the recording. A reproduction of a well-known ambrotype that is often misidentified as three soldiers in Braxton Bragg’s Army of Tennessee is presented, this time with correct identification. From left to right, the author provides short biographical information about the three members of Company D, the “Madison Home Guards” from the 3rd Georgia Infantry that was part of the Army of Northern Virginia: Columbus C. Taylor who is wearing a neck scarf, James D. Jackson with a slouch hat with “3 G V” in brass letters, and James H. Porter wearing a light kepi. Both Taylor and Jackson died at Malvern Hill, while Porter’s military record ends with a muster roll notation that he was detailed to railroad service. He was young and he was enthusiastic, and he had eyesight that would not have passed an Army physical. The article takes the reader from his first job at the Kansas City Star to his first work with the American Red Cross in Italy, and shows where his experiences with being wounded and falling in love with the nurse tending him at the A.R.C. hospital in Milan (Agnes von Kurowsky) intersects with his later writing, most specifically A Farewell to Arms. Hemingway was seriously wounded when an Austrian mortar hit the group of Italian soldiers he was conversing with. With over 200 pieces of shrapnel in his legs, Hemingway was trying to get one of the wounded to safety when he was then hit with machine gun bullets in his knee before he and the wounded man he carried were able to get to a command post. Hemingway was decorated with Italy’s Croce di Guerra and Medaglia di Valore for this act. After attempting to return to the front, Agnes was able to convince him to return stateside, which he did, finding that his story as the first American wounded in Italy had been followed back home. His legs still painful, unable to relate to people at home, unemployed, and depressed after Agnes broke their engagement, Hemingway had the material needed to begin writing some of his most memorable fiction, and led to his need to eventually return to war in Europe. A need for soldiers was still evident in late 1862, when Massachusetts came to an agreement with a group of men in California led by J. Sewall Reed who desired to fight for the Union in the Civil War. Because the War Department did not want to transfer men from the West to the East to fight, these 100 men agreed that their bounties from Massachusetts would be used for their transportation over Panama in December 1862; the troopers making up this unique cavalry unit known as the “California Hundred” (Company A of the 2nd Massachusetts Cavalry) would supply their own uniforms and equipment. The “California Battalion” was comprised of an additional 400 men from California who also wanted to join the fighting, and made a similar request which allowed them to follow in March 1863; they were designated as Companies E, F, L, and M. Initially, the California Hundred (soon followed by the rest of the 2nd Massachusetts) were sent to engage with the Rebels in “Mosby’s Confederacy” and in August were able to seriously wound Major John Mosby at Gooding’s Tavern. At a planned skirmish in February 1864, Mosby and his forces were able to ambush and kill five of the Californians, including Captain J.S. Reed, the organizer of the Hundred. Other actions of the California Hundred and Battalion included protecting Washington, D.C. from the assaults of Jubal Early, action in the Valley under the command of Phil Sheridan, the battle held at Saylor’s Creek, and the surrender at Appomattox Court House. Several images of command officers and unknown troopers accompany the article, along with a photograph of their encampment during the winter of 1863-4 in Vienna, Virginia. The Fall 1983 catalog for the Stametelos establishment “Sutler’s Wagon” included an example of what was called “that Crazy Cap” in the Volume V, No. 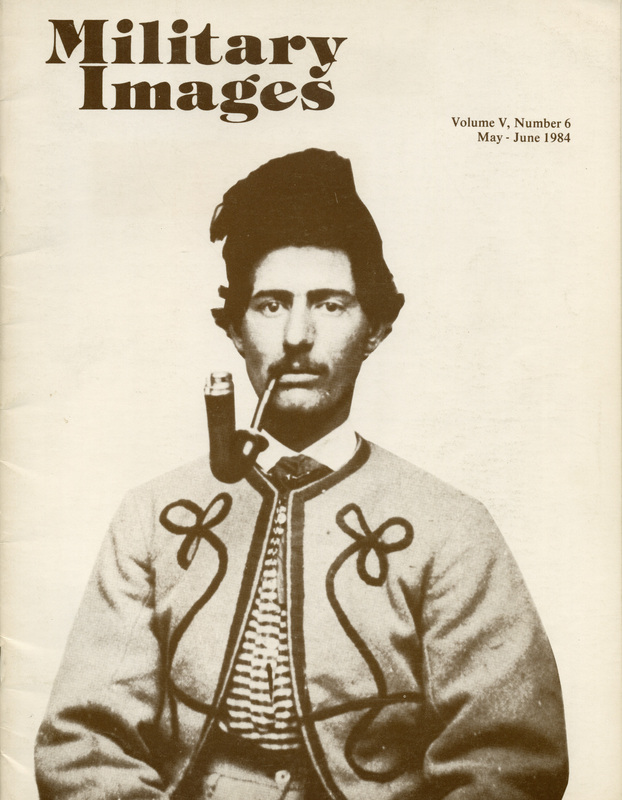 4 issue of Military Images. This article in this issue of MI provides patent drawings, several current photographs of the cap being worn, and a contemporary view of a “Yankee stalwart” wearing the cap. A drawing from Frank Leslie’s Illustrated Weekly from 1862, which shows how the common error of thinking the soldiers of the 4th New Hampshire Infantry wore pith helmets began, is also included in this detailed history of an unique piece of military gear. The third pictorial of the uniforms inspired by French colonial troops in North Africa is presented, with 27 different images. Two vivandieres from Zouave units are included as well. With the vast majority of the images from the Spanish-American War in 1898, the 25 images in this article illustrate the history described in the article, which begins with the origins of the militia regiment in the era of the “Know Nothings” and reaction to a great influx of immigration into the New York City of 1849. Reenlistments after the three-month initial enlistments expired shortly after Bull Run in 1861 led to the renaming of the organization as a National Guard unit, which was called into action on a number of occasions. After the Civil War, the regiment was used to quell riots, but did not see significant action again until the Spanish-American War when they were part of the 1st Brigade of the 1st Division. 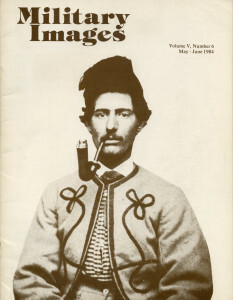 On July 1, 1898, the 71st prepared to engage the Spanish at San Juan Hill, which the article describes in some detail; many of the images were taken by Lt. Herbert True of Company L, commander of the pioneer company for the brigade. With the gradual replacement of a sail navy by steam powered vessels, the insignia of this new navy needed to be updated. In 1881, the use of a screw propeller with an anchor began as the insignia of a U.S. Navy Machinist. In 1886, an eagle and chevrons were added to designate the wearer as a petty officer. An image taken between 1881-86 by one of the crew of the U.S.S. Ranger (identified on the hatband of one sailor) reveals the use of the insignia on the lower part of a coat sleeve. The insignia image was magnified for clarity. Article titles and authors are indicated for each issue. Miss Katherine Andrews wears her Y.M.C.A. uniform along with an insignia of the 23rd Infantry Regiment, 2nd Division from World War One.